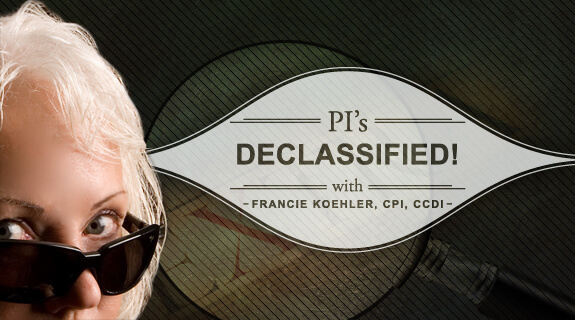 PInow Marketing Consultant Mindy Naumer appeared on PIs Declassified with Francie Koehler to discuss online marketing for investigators. The podcast covered marketing basics, websites, social media, and getting links. You can listen to the podcast below. The most common question is, "How do I get to be #1 on Google?" The first segment centers around the most common question PInow is asked, which is, "How do I get to be #1 on Google?" There are over 200 ranking factors that Google considers when deciding how to rank results, and those change throughout the year. 70% of people who are looking for service-based professionals are doing so on the Internet. Over 400,000 geo-targeted searches are done every minute on Google. Geo-targeted means searching for the industry as well as the location. Every company needs a website. SEO, search engine optimization, means you're doing everything you can to be found by the search engines. Local search can help your business show up in geo-targeted search results. "There are a lot of companies out there that will call your company and say, 'It's $500 and we will guarantee you page one,'" Naumer said. "This is a big red flag." Because of the way Google ranks results, no person or company can guarantee that you will show up as the first result. Think of your website as your online brochure. We used to hand them out a lot. Now everyone goes to the Internet . . . When I'm hiring somebody, the first thing I do is look at their website. As search continues to shift to online, your website becomes your online brochure or storefront. Your website should be professional. Contact information should be on every page. Your company name should be your website domain name. i.e. XYZ Investigations should have the website domain www.xyzinvestigations.com. Your email address should be linked to your domain. Have a blog if you can commit to posting regularly. It's important to have a web presence, but your website should also be optimized for search engines. Private investigators who are just starting out may want to look for a templated, turnkey website to get started. Quality over quantity. A good question to ask is, "If Google didn't exist, would I want this link?" If you're only doing it for SEO purposes, don't do it. Mindy shares that she gets a lot of questions about social media and getting links. Social media is a free marketing tool and is a great tool for finding professional industry groups. Do I need to get Twitter and Facebook for my business? Yes. Keep personal and professional social profiles separate. Make sure you're posting industry-relevant information. You want links to your business on industry-specific sites. With links, you want quality over quantity. Never buy links. Always ask yourself, "If Google didn't exist, would you want this link?" If the answer is yes, then you should get the link. If the answer is no or maybe, you probably don't want it and it probably won't help your rankings. Stick to what you know, and hire a professional to do the rest. 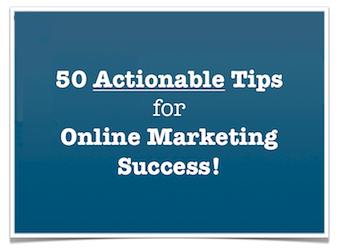 To download our list of 50 Actionable Tips for Online Marketing Success, fill out the form below. Please fill out the form on this page to download our 50 tips for marketing success.